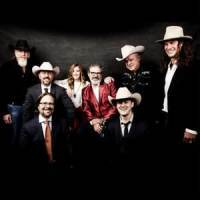 It all started when Ray Benson, Floyd Domino, and Lucky Oceans, along with a Vermont farm boy named Leroy Preston; Virginian Chris O'Connell; and Gene Dobkin, a bass player and fellow classmate of Benson's from Antioch College in Yellow Springs, Ohio, joined forces. They began with a simple goal: to play and help revive American roots music. Asleep at the Wheel is an American country music group that was formed in Paw Paw, West Virginia and is based in Austin, Texas. The band has won nine Grammy Awards since their 1970 inception, released over twenty albums, and has charted more than 20 singles on the Billboard country charts. Their highest-charting single, "The Letter That Johnny Walker Read", peaked at No. 10 in 1975.